WHAT WILL YOU BARGAIN FOR LIFE’S SAKE? Arthur Olsen was diagnosed with lung cancer. Now his time was torn between pursuing aggressive treatments and chasing his passion. But what would mean in the end is still his long-life dream, even if it means meeting death. Stories within a story, The Lighthouse tells how Arthur Olsen played with the cards dealth to him. At the age of forty, he was diagnosed for having nine malignant tumors across his right and left lungs, But health did not become his priority at first. He did not have the money to pursue treatments and so he retreated to what he thinks would heal his soul-writing. 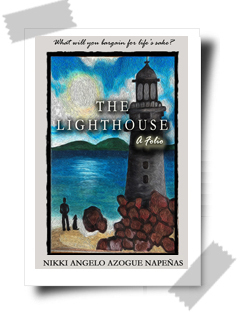 Instead of submitting himself to hospitals for various medical interventions, he locked himself up inside his cottage near the lighthouse, where he wrote stories every day, with the pursuit to maximize the time left for him. And so five stories were born, five life changing stories left unpublished in his journal.